Needle Cricothyrotomy vs. Bougie Cricothyrotomy; Needle or Knife? In this episode, I debate Minh Le Cong, a retrieval physician from Australia. The question is what technique should we use in the can't intubate/can't oxygenate (CICO) situation. Throughout the podcast, you will hear reference to Dr. Andrew Heard, who has written some fantastic papers on the subject. Perhaps most pertinent is his description of the formation of a CICO protocol based on his experience with a wet sheep airway instruction lab. Heard AM, Green RJ, Eakins P. The formulation and introduction of a ‘can't intubate, can't ventilate' algorithm into clinical practice. Anaesthesia. 2009 Jun;64(6):601-8. The paper on the use of ultrasound to find the cricothyroid membrane is quite interesting. See my prior posts on how to perform the bougie-aided cricothyrotomy and the cric show. One of the best things Minh expressed is the need to say OUT LOUD: “This is a can't intubate/can't oxygenate situation.” Saying it out loud lets everyone in the room know, there will be no more screwing around with attempts at direct laryngoscopy. Go to the Broome Docs Blog for more Minh Le Cong. He is an incredible guy, expect to hear more from Minh on the podcast. I also gave a shout-out to a new podcast, the Emergency Ultrasound Podcast. Scott Weingart. Podcast 053 – Needle vs. Knife: Part I. EMCrit Blog. Published on August 9, 2011. Accessed on April 23rd 2019. Available at [https://emcrit.org/emcrit/cricothyrotomy-needle-or-knife/ ]. I was perhaps not clear enough on my comment regarding ETCO2. It is not just that it confirms that the ETT or trach is in place, it confirms that the patient is oxygenating and ventilating and I know beyond a shadow of a doubt that they are getting better even if their pulse ox is lagging. The second I see that CO2 spike, I know I can relax. The feedback from a three way stopcock just tells me some oxygen is going somewhere, not if the patient will respond to it and improve or whether I’ll have to grab my scalpel in a minute. Yes peds needles needle cric, no argument here. If folks think that learning only one technique that works for adults and peds is a good idea, then it is a point for the needle cric. I think the BVM through an ETT adapter is a guaranteed fail, b/c you don’t get enough gas flow to even provide apneic ox, much less ventilation. This has been shown in a few studies that can be found on crashingpatient.com. Jet ventilation is a great technique for controlled anesthetic cases with confirmed commercial catheters. I think the only acceptable ones are those with internal pressure cut-offs so in case the catheter is misplaced you know immediately. I was glad that jet went did not come up in the debate as I think in a failed airway situation it is the path to the grave. Great debate. Gotta say – I am on your team – having seen a needle cric go horribly wrong. I am much happier with a scalpel-bougie technique. The relief of knowing you have a cuffed, definitive tube in place is my goal, I can squeeze on the trusty Air-viva bag and know I am moving air. It is the “money” as you say, there is no awkward pause waiting for the sats to come up or the EKG to go flat…. He was kind enough to answer a number of questions on the topic. Oh and last point – the “can’t intubate, can just ventilate but need a definitive airway” scenario is much more common in my experience – for me this is also a scalpel-bougie scenario – I have not trained with the dedicated airway kits and have gone with the one technique for all occasions. It would seem equal that in the cannot intubate but can ventilate how you do the surgical airway does not matter. A needle approach with, seldinger technique like the Melker kit is valid and supported by the literature. If you don’t have such a kit, then sure scalpel bougie technique. If you don’t have a bougie then standard open surgical cric technique. But Casey, even you recently described a case of a 10yo child with bacterial tracheitis. Do you really think scalpel bougie would work in a child and psychologically are you prepared that is your fall back technique across all age groups? Casey, I saw the post as soon as it was written; great stuff! I would be appreciative if you would send Dr. Heard the link to this page so if he gets a chance he can listen and possibly comment. Thanks for the cric podcast with minh. I am yet to have to do or see a cric in 6 years or so of training (the uk is unusually reticent about using this; I have been in situations were i think it should have been used but persistent intubation attempts were used instead…) but I think after reading and thinking about this procedure I’m fairly convinced a scalpel technique is the way to go. Though to be fair I do teach anatomy for a living at the moment and am perhaps more confident with a scaple than most! The tendency to choose or favour a needle technique seems to be a perceived (and I emphasis perceived) confidence that needle technique are easier and more dependable. – the ability to be able to do this blindfolded and by palpation is key. The point I would add to those two is to practice a few hundred times. This seems daunting until you realize that the trainer made up from some vent tubing and two rolls of tape is fairly realistic and allows you to practice 20-30 times in 10 minutes. See the cric video on this site to see the trainer. From my perspective there are only two difficult things about this procedure: getting the gumption to move to it and then being able to do it blind. My EMS service has adopted your trainer in our bougie assisted cric. Works great! For kids – tough, very rare outside of rare syndromes. Needle cric is probably the bet here as the flOws and volumes are more achievable. You concede then needle cric is superior as it covers all age groups? Or you concede that both techniques are valid depending upon the patient? In other words non inferiority of needle vs knife? Which means you have changed your opinion? As soon as I heard Scott’s training technique of blindfolding the operator whilst performing a scalpel bougie technique, I thought of HUET (as discussed by Minh). It is fascinating that in certain situations, the removal one of our primary senses may improve our ability to perform a critical intervention. This is also akin to the ‘sterile cockpit’ phenomena whereby pilots ask for quiet during take-off and landing. for the readers, HUET is Helicopter Underwater Egress Training. Never heard about sterile cockpit before, fantastic rule. Minh, I’m on your side. Needle cric is a temporary oxygenating procedure, with no more things that can go wrong than scalpel and bougie, especially in a situation where the operator’s arenal gland output probably excedes that of the patient. Once performed, the point is to not sit back and enjoy the success, but to move on and secure a definitive airway from the top or by opening the tract along a guidewire placed through the 14G. With the use of ultrasound, rather than marking the site, have you tried real-time scanning to guide the needle down on to the cricothyroid membrane? Again, as you have stated in the above replies, it does not have to be a mutually exclusive skill, as having options gives greater latitude to deal with particularly tricky cases. you just need to be (appropriately) confident in your abilities. Finally, I really like the blindfold training. I’ve used and seen this used in a number of procedural skills training, including having to run a MET (Medical Emergency Team) scenario as a blindfolded team leader. It really reinforces the tactile nature of many of the procedures that we do and gets you paying attention to feedback. No I have not tried real time scanning to guide needle cric. I am also unaware of any published studies examining this. Quite frankly in the CICV/CICO situation I would not do it as it is just another factor to think about and get wrong. Its real role is in the impalpable neck patient who you have time to do some airway assessment and mark where the trachea is and the cricothyroid membrane. Dr Heard advocates in these cases if you have the time, to insert a cannula through the cricothyroid membrane prior to your intubation attempt, just in case things go astray. We are nothing but somewhat superstitious sometimes in emergency medicine ( who believes in full moon night shift chaos?) and I believe by marking the surgical airway sites on the neck using USS prior to a predicted difficult airway tube then it wards off the evil spirits. I think I would feel better about needle cric if folks did have the formal jet ventilators. Just for the record, nobody here has advocated the BVM/adapter approach, which just doesn’t work. Seth’s video of fiberosptic-stylet aided cricothyrotomy is on the site. An interview with Dan Cook, inventor of the AirQ ILA, is here as well. It is my preferred SGA and seemingly Jim’s as well. I’ll also have an EMCrit Short with Seth Manoach on catheter selection issues if you are going to do a needle cric. King Systems (who produce the King Airway family, LT-D/LTS-D) has their King Vision video laryngoscope which appears to debut around USD 900 and USD 25 per blade. I was fortunate enough to try them in Dr. Levitan’s airway lab and am working to get these integrated into my system. Their price/performance point is excellent. That’s an incredible price and given the current exchange rate even cheaper for me to buy and try! What did Levitan think of it? I don’t recall if Dr. Levitan spoke on it specifically besides an intro to its use (and its price). However, I personally found it far better than the AirTraq and C-Mac. Perhaps most attractive was the ability to switch between channeled and a normal blade. The screen on it is gorgeous as well. I would recommend getting a demo to play with and see if it impresses you as it has me. We use a bonfil rather than the levitan, but the use is pretty much the same. We bent it to the ideal shape for use with the AirQs. This was petrifying to do, but once done it is now an incredibly versatile device as Jim points out above. I’ll be posting 2 of Jim’s incredible videos tonight. Check it out..it’s got some useful information. I just successfully (and easily) did a crash cric on a patient with anaphylaxis (huge tongue) which anesthesia couldn’t incubate/ventilate using the methods I learned from Scott Weingarts website (and have practiced and thought about a lot too) last night on the medicine ward. I was called overhead to assist. What this technique does not require is having advanced surgical skills. It simply requires making the decision to do it and knowing the technique which Weingart describes in his video. It works. And let me tell you…. It worked so much better than I ever could have anticipated. This patient would have died with the needle method. In fact, this patient would have died with her body habitus had i tried doing a quick elective style surgical approach. Regarding needle….Equipment not around, very fat neck, no jet ventilator, and she was so hypercarbic that she needed some drastic ventilation to lower her CO2 which a needle won’t do. Thank you Scott! This save was just as much a function of your podcast as it was my knife! Merry Christmas Leon and Scott! To bestow the gift of a life saving cric to a critical patient, all through the mentorship of social media and emcrit.org. Jolly good show, chaps! Needle vs knife, it does not matter as long as you decide to act. the delay in acting is what is detrimental. if this podcast, blog discussion and Scotts videos has enabled Leon to sAve one life, what a great way to end the year! Happy new year guys! I want to offer a heartfelt THANK YOU for the education you gave me and others on bougie aided cric. I listened and watched last year, taught my group last year with the model you showed…… and saved a life today. As I cut into the neck your voice was in my head saying:”Don’t worry about the blood, do it blind”. I crapped my pants but saved a life after both myself and an anesthetist failed at RSI 3+ times and desats started. I owe you! online airway management training. No OR needed! Only streaming videos and podcasts, bits of cheap plastic tubing and tape. No fancy expensive video laryngoscopes or awake topicalised techniques. And voila, two lives saved! Now the next challenge Scott is to use Emcrit.org to teach anaesthetists to pick up the knife after failed RSI 3 + times…instead of the faecally incontinent EM physician who channelled the spirit of Emcrit.org to guide his/her hand to do what needed to be done. ” dont worry about the blood, do it blind”, almost biblical words of power! The preferred oxygenation technique taught at Royal Perth Hospital is not a 3 way tap device- it is a T-piece device which they have designed and studied. The 3 way tap device can be dangerous since it does not permit expiration when connected to oxygen at 15l/min. Well, as usual, Minh replied more quickly and comprehensively than I could. I want to echo the difference between upper airway obstruction cases vs. difficult airway with open cords. In the latter, the 3 way stopcock is fine. In the former, Minh’s method of holding and removing the bare tubing is the best way to go. The true ideal and what I will do a blog post on shortly is using the ventilator. Minh’s video and post will be up next week. I’ve used the McGrath as well, but found it got schmutz on the lens more readily than the King Vision did. Otherwise I very much enjoy the McGrath’s form factor. Were the videos pulled from the show notes? I’m not seeing any hyperlinks. Tension Pneumothorax - whew that's a lung-full! 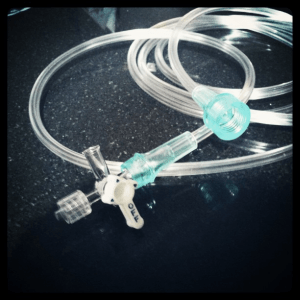 I have yet to do a needle cric since adopting the NODESAT technique of nasal cannula during RSI. My opinion is that the needle cric is a way of bypassing the problem supraglottically. its not the be all or end all and certainly can fail but it is quicker to do and certainly I know of at least 4 cases where it rescued the situation. I think if NODESAT is on and you fail to tube duringRSI. and it develops into CICV situation, then you do whatever you can to bypass the problem. needle, knife whatever! get oxygen in by bypassing the problem. we had one case where a junior doc used the needle cric to rescue the CICV and then kept it going all the way to OR whereENT. did the formal surgical airway. but I would not say right now, seeing what I have seen, that if NODESAT is failing , then needle cric is useless. One option not discussed was using a 3.0 ETT adapter wedged into the hub of an IV cath or NDC needle hooked up to a bag-valve device w/ supplied O2 to provide positive pressure ventilation instead of apnoeic oxygenation. The 3.0 ETT adapter will fit in any size IV hub from a 10ga NDC needle to a 24ga IV catheter. I personally always thought I would do a tiered method of a quick needle crich with my 10ga NDC needle, connect to BVD using the adapter off of a 3.0 ETT while prepping for a definitive surgical crich. When the opportunity presented itself, you’re absolutely right, the idea of a needle crich never crossed my mind because I had trained on and prepared myself for the surg-crich so heavily that it had become my default, under duress decision I had unknowingly already made in my head.